Army Specialist Eduardo Fuentes-Bueno first joined the military when he enlisted in the U.S. Marines in 2007, and served his county through the end of his contract in 2011. He immediately re-enlisted in the Army National Guard in Florence Arizona. 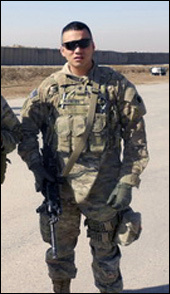 Specialist Fuentes-Bueno was injured on February 26, 2012 in Afghanistan when the personnel security detail team he was attached to was attacked by civilians and enemy combatants. Fuentes-Bueno was struck in the left eye by shrapnel from a grenade. He suffered serious injuries to his frontal lobe of his brain, and his left and right legs. He immediately underwent surgery to remove the shrapnel from his brain. He’s been diagnosed with a traumatic brain injury and post traumatic stress disorder. He spent two months at Walter Reed, and three months at the Palo Alto VA.
Fuentes-Bueno earned the Purple Heart, Global War on Terrorism Service Medal, Afghanistan Campaign Medal, NATO Service Medal, Combat Infantry Badge, Overseas Service Ribbon, National Defense Service Medal, Humanitarian Service Medal, and theSea Service Deployment Ribbon. SPC Fuentes-Bueno, his wife Maria, and daughter Maria would like to reside in Peoria, Arizona. SPC Fuentes-Bueno is currently attending college, and would like to work for the Department of Justice. Building Homes for Heroes gifted the Fuentes-Bueno family a home in Arizona in 2014.